The word navjote is a composite of two words meaning new (nav) and worshipper (jote). It represents initiation into the Zarathushtrian fold out of free choice. In Iran this ritual is called "sudreh-pushi" or the ceremony at which one is invested with the sudreh. - To do good because it is the correct thing to do, and not for praise or reward. - To give respect to others who are righteous regardless of race, colour, status or religion. - To look after the less fortunate. The ceremony originated in the reign of King Jamshed, long before Asho Zarathushtra lived. Therefore, it is a pre-Zarathushtrian ritual of welcoming children into adulthood. The concept behind it is that once the child has had his or her navjote, s/he is old enough to take responsibility for her actions. Asho Zarathushtra was fifteen when he was invested with the sudreh and kusti, in those days old enough to be married. If you consider the concept behind the navjote, do you think our seven- or even nine-year olds are quite ready to understand fully what they are committing? Perhaps, this ceremony would have more significance if it were performed at an older age. The festivities associated with the navjote are not part of the essential religious ritual. The new clothes and gifts and feasting are ways the family share their joy with the rest of the community. What is the concept behind dokhmanashini? Don't you find it gruesome? To answer the second question first, no I do not find the concept gruesome. For the simple reason that it is a part of the natural cycle of life. You don't see burial services for ants or crematoriums for orchids, so why should human beings be given different treatment by Nature? If you study the habits of any eco-friendly community - the Native Americans or the Inuit - you will see that they too have similar practices. Dokhmanashini refers to the fact that after death the body is placed in a tower (dokhma) far away from residential areas, on top of hills if possible. The dokhma is often referred to rather poetically as the Tower of Silence. Ideally, the dokhma is surrounded by heavy coverage of trees where vultures, Nature's scavengers, live. They destroy the body much faster than the millions of worms and insects that feed on the body that is buried. Another reason why I do not find the concept gruesome is because I believe what our religion says about the soul being the life spark in a material body. Once the soul departs, the physical body is like a set of clothes, to be discarded without much ado. Think of it this way, after you removed your jeans and left the room, if someone cut off a part of it, you wouldn't feel any physical pain. The action would be far removed. Another reason why dokhmanashini is advocated is because it fits in with the concept that once the soul departs, there should be no earthly reminder of the body left where family members can go to mourn. Mourning is strictly frowned upon as far as Zarathushtrianism is concerned, because by doing so we are resisting the natural cycle of birth and death. Also, if you believe that the souls visit the family whenever you invite them, why would you need to go to a place where the "jeans were discarded" so to speak. This is the reason why we remember the souls of the departed ones with offerings of flowers, milk and fruit. It is like inviting cherished guests for a feast, a time to be happy, time to think of good times that were shared. Of course, one has to be realistic enough to find alternate ways of disposing the dead nowadays when many cities do not have the population of Zarathushtrians to merit a Tower of Silence, or where civic laws do not allow for such buildings. What we have to keep in mind is that the method should be as pollution-free as possible, and that there should be no physical markers (gravestones, for example). Why do we have the fire as a focal point in our religious practices? Are we fire worshippers? First of all, if you feel embarrassed at having the label "fire worshipper" thrown at you, don't be. Only the ignorant people say this because it is a popular myth. Zarathushtrians are not fire worshippers. We DO NOT think fire is a god. We have only one God, Ahura Mazda. *Yazd is the Persian form of Ahura Mazda. Now, for the reason why fire is a focal point in our religion. First of all ours is not the only religion that says that God is light. Muslims refer to Noor-e-Ilahi, which means the Light Of God, and then there is the story of Moses who asked to see God, and was blinded by the light which reduced a mountain to ashes. In our faith, fire is used symbolically to represent the khvareh or radiance of Ahura Mazda. - Unlike other religious symbols it is not conceived or constructed by humans, but is found in nature. - It has the ability to purify. (People boil water to kill germs; use fire to sterilise instruments; use the ash to apply on wounds in the absence of antiseptics). Also, remember that close to four thousand years ago, at the time when Asho Zarathushtra preached his message, people still believed in gods they could see like Mithra (sun) or Anahita (waters). To them fire gave warmth, lighted up the darkness, kept wild animals at bay, and the flames always pointed upwards towards the heavens. The fact that fire had the power to destroy if not tended with care also gave rise to awe. Keeping such a scenario in mind, you can see why these people readily accepted fire as a physical symbol of Ahura Mazda whom they could not see. But once again I stress, we do not revere fire as a god. What is the significance of the farohar? Present day Zarathushtrians invest more religious significance to the farohar than it merits. People actually discuss which is the correct farohar - the one with the head or the one without it. And further debate which direction the head should face! The reality is that it is not even originally an indigenous Persian symbol, but was adopted from the Assyrians by the Achaemenians. The Achaemenian kings liked it, probably as an art form, and so had it carved into the friezes throughout their kingdom. It appears to denote a celestial spirit that looked over the kingdom and blessed it. This is probably how the idea that the farohar represents Ahura Mazda was fanned. Please let me clarify that the farohar is NOT Ahura Mazda. It is just a symbol, like the fire urn. People have invested meaning into its wings and the kingly figurehead. If you stop to think you'll realise that if the Achaemenians had liked a picture of a dog or a dragon instead of this winged figure, we would probably be seeing pendants of that instead of the farohar. The farohar is simultaneously seen as a symbol of the souls of departed ones, the fravashis. Whatever it's original meaning, today it has come to signify a positive force that looks after us, something like a guardian angel. Fair enough - one can do with all the protective guidance one can get, but as long as one comprehends that Asho Zarathushtra wouldn't have recognised one if it had come up and hugged him. Why is the significance of Jamshedi Navroze? Ten thousand years ago, King Jamshed Peshdadiyan founded the festival of Navrooz (meaning "new day" in Persian) to celebrate the coming of spring after the cold, dark winter. If you recall that in those times Iran was a pastoral community, you can appreciate that this festival marks the triumph of good over evil with light literally defeating darkness as Navrooz falls on the Vernal Equinox, when night equals day, and subsequently the hours of daylight increase. Today, Navrooz is celebrated the world over by people influenced by Iranian culture, notably the Zarathushtrians (Parsis), Shi'ite Muslims, Bahais, and Kurds. What makes Navrooz unique is that it is the only holiday celebrated by several religious communities. Among the best known customs of Navrooz is the "sofreh haft-seen" - or tablecloth with seven gifts of Nature with names beginning with the Farsi letter "seen" (see Box). A week or so before the holiday, grains of wheat and lentils are placed in bowls to sprout into a mass of greenery, symbolizing growth. The table is also laden with fruit, nuts, sweets and snacks, candles, and the holy book (the Avesta for Zarathushtrians, the Quran for Muslims). A bowl with goldfish and a basket of colored eggs, indicating new life, are also placed on the table. Custom dictates that visitors who come to share the holiday with you should be sprinkled with fragrant rosewater and asked to look into a mirror to make a wish. Some say that this ritual symbolizes that you smell as sweet as roses and shine as bright as a mirror throughout the new year. The Haft Seen table symbolizes the holiday spirit in much the same way the Christmas tree promotes a special festive mood and the table is kept replenished for thirteen days. 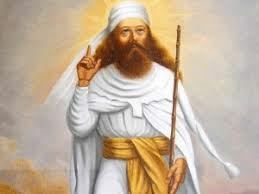 To the ancient Zarathushtrians, the sixth day was called the Novrooz Bozorg or "greater Navrooz" as it was celebrated as the birthday of Asho Zarathushtra. The Fasli Zarathushtrians still celebrate this day, but it has lost its significance for the rest of us. Nowadays in Iran, the celebrations end on the thirteenth day with people going for a picnic by streams and rivers. The sprouted lentils are thrown into running water, carrying away the bad luck of the previous year. What is the significance of the Farvardegan days? Ten days before the beginning of the new calendar year, Zarathushtis spend time remembering family and friends who no longer walk the earth. The likes of Sylvia Browne aside, few can say with any certainty what happens after we die, so this tradition of observing Farvardegan is largely symbolic…and movingly poetic…if you grasp the inherent meaning of the term. Farvardegan is Pahlavi for "days of nourishment". This observance is better known by Zarathushti-Parsis as Muktad which is derived from the Sanskrit words mukta atma meaning "free soul". According to Zarathushti belief, during the ten Farvardegan days souls return to Earth, escorted by highly-evolved souls known as ashaunam fravashinam. They come down to cleanse the earth, to answer calls for help and, perhaps, to enjoy time spent with loved ones. In return, they ask for fond remembrance and nourishment to keep their strength up for the work they have been called upon to do. The Avesta states that the fravashis sing, "Who will praise us? Who will offer us prayers? Who will meditate upon us? Who will love us? Who will receive and welcome us with food and clothes in hand and with a prayer worthy of bliss?" It is because of this belief that the practice of setting fragrant flowers, new clothes and favorite meals every day for ten days evolved. At dawn on new year's day (Fravardin mah, Hormazd roj), a special dron and afrinagan ceremony is performed to bid farewell to the fravashis. In olden days, families used to continue to pray for an additional seven days, giving the souls enough time to return to their ethereal destination. Nowadays, we're so busy with our lives that the tradition of observing Farvardegan at home is slowly…er…dying out. It is being relegated to a formality that we have no time for, with prayers recited by uninvolved mobeds at the local Darb-e-Meher. This is sad when you come to think of it. The people who shaped our past are intrinsically woven into our futures, and it is only by remembering them that we move forward. Not only is Farvardegan of social importance since the prevailing mood is getting ready to welcome cherished guests so the house gets a thorough cleaning and families get together, it is also of emotional value as we learn to let go differences and distances that grew while people were alive, and of spiritual significance as we are reminded of the fleeting nature of our own existence. It is also a great time to celebrate the living - to take out the time to write that email, make that phone call, mail those photographs that we have been meaning to for ages. Also, the Farvardegan days can be used to touch base with our roots by recounting family anecdotes. You know, the story about how Grandpapa gate-crashed the Mayor's wedding, or how Kholeh Mehri dozed off in the middle of chairing an important public meeting. This nurtures our sense of belonging, of continuity, and that is something we need to hold on to in the diverse and multi-cultural society that we live in today. The people who lived in ancient Iran during Zarathushtra's time were mainly farmers, so they depended on the seasons to tell them when to plant their crops and when to harvest them. Avestan texts (books written in the ancient language that was spoken during Zarathushtra's time) divide the Iranian year into two seasons. The first season was Hama or summer, and the other was Zayana or winter. The Iranians celebrated six seasonal festivals or gahambars such as "the feast of bringing in the corn" or "home-coming feast" when the herds came down from the mountain pastures where they had been grazing. Each festival honored one special creation of Ahura Mazda and the amesha spenta or archangel who looks after that creation. The festivities included thanksgiving prayers, sharing food with family and friends, singing and generally having a good time. Traditionally, each of these gahambars lasted for five days, but for certain reasons that are too complicated to explain briefly, the sixth gahambar was later extended to ten days. This gahambar is generally known as Farvardegan, and during this time we remember family members and friends who have died, and invite them into our homes to feast with us. The table below gives details of the different gahambars. After the sixth gahambar, the people celebrated the end of winter and coming of spring (Navroze). The funny thing is that because of certain reasons which are once again too complicated to explain briefly, our calendar months kept on shifting over the centuries so now many Zarathushtis celebrate the mid-autumn Ayathrima gahambar in March! Besides the seasonal gahambar, there is another kind as well. These are gifted to the community by a family in memory of someone special to them. In this kind of gahambar, a jashan is performed in memory of the deceased person and then the family hosts a meal for the whole neighborhood or village. In India and Pakistan, such gahambars are often hosted by rich families as a form of charity. The traditional gahambar menu is dhansak, papeta ma gos (meat with potatoes) and mango ice-cream.